AMES, Iowa – Parents know that co-sleeping is considered a no-no, but many still allow their children to crawl into bed with them at night. Doctors generally discourage co-sleeping, because of its link to sudden infant death syndrome or SIDS. However, Susan Stewart, a professor of sociology at Iowa State University, found that many parents still co-sleep with their children, and it is a phenomenon that extends well beyond the infant and toddler years. 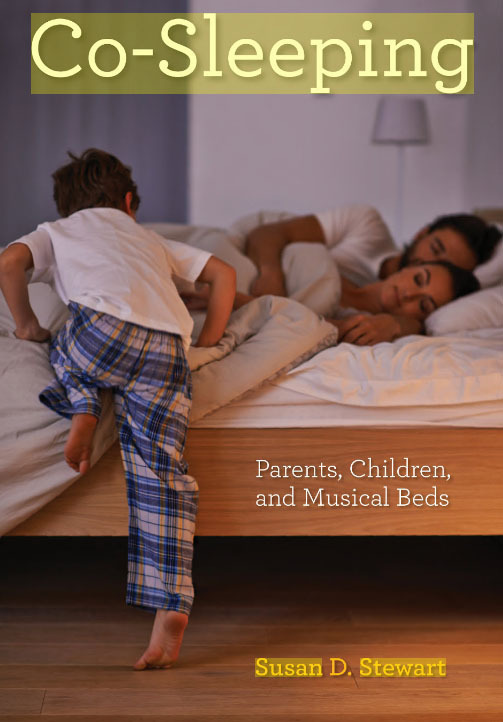 In her new book, “Co‑Sleeping: Parents, Children, and Musical Beds,” Stewart explores the reasons why parents allow their children to sleep with them instead of in their own beds. She found a lot of activity takes place at night in a variety of scenarios. In some families, children started out in their own bed and then went into their parents’ bed in the middle of the night. This sometimes resulted in one parent being “squished out,” forcing them to move to the couch or the child’s bed. In other households, children might be allowed to sleep on a mattress or in a sleeping bag on the floor of their parents’ bedroom. Stewart says the prohibition against co-sleeping is so strong that in one family the mother, wanting to be close to her child, slept on a mattress next to the child’s crib. Stewart interviewed 51 parents who co-sleep and found many would prefer not to sleep with their children. The shame and stigma associated with co-sleeping is so great that about half of the parents denied or avoided discussing it with family or their pediatrician. However, some of parents said they slept better and had fewer disruptions throughout the night when everyone slept in one room or bed, rather than spending the night playing musical beds. While co-sleeping is frowned upon in the U.S., it is perfectly normal in other cultures. Stewart says it’s more acceptable in Scandinavian, Asian and South American countries, where rates of SIDS are far lower than in the U.S. The decision to co-sleep is sometimes related to economics, because there are not enough rooms or beds in the home. Stewart asked both mothers and fathers how co-sleeping affected their relationships and intimacy. Most parents said co-sleeping did interfere at times with physical intimacy, but it was not a major issue. As for emotional intimacy, Stewart found co-sleeping allowed busy parents to spend quality time as a family. This was especially true for dads who tended to spend more time away from home. Stewart says if parents co-sleep safely, there are many positive benefits. For example, studies have found that children who sleep with their parents feel more secure or attached to their parents, and as a result are more independent. However, co-sleeping can negatively affect sleep quality. Many parents mentioned waking up numerous times at night as a result of their children kicking them or flailing about. How does it start? How does it end? Parents had a hard time recalling exactly when and how they started co-sleeping. Many said it wasn’t planned or discussed, it “just happened.” Stewart says one father shared that they had bought a crib, but they never even took it out of the box. Putting an end to co-sleeping often starts with a plan, but executing it can be a challenge. Stewart says parents gave several examples of setting timeframes, such as telling their children they would have to sleep in their own bed once school starts. Despite efforts by parents to put an end to co-sleeping, for many families it ended naturally without a plan. During her conversations with parents, Stewart learned a lot about the pressure parents feel to raise a “perfect” child. Many parents used work-related words or phrases – parenting is 24-7, being on the clock, all hands on deck – to describe the incredible amount of activity that takes place at night. Stewart says in American society there is a great deal of competition among parents, which is why many families hide the fact that they co-sleep. Stewart says these comments and concerns from parents speak to larger issues in the U.S., such as the need for paid maternity leave and adequate vacation or sick leave that benefit families. Parents know that co-sleeping is considered a no-no, but many still allow their children to crawl into bed with them at night. Doctors generally discourage co-sleeping, but Susan Stewart, a professor of sociology at Iowa State University, says it is a phenomenon that extends well beyond the infant and toddler years.